Finally had to get out the giant (32-foot) extension ladder and clean the gutters this morning. Every time it takes me longer. It’s not the climbing the ladder, it’s the carrying it and especially the standing it up and maneuvering it into position. 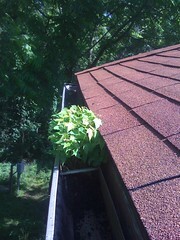 I think I’d better get new gutters with the covers on them so that I don’t have to do this. Before the house rots away. I did discover a convenient use for the Iphone, though — while I was up there I had the ladder next to a corner, but I couldn’t see around the corner to tell if the gutter was blocked. I was able to hold the phone out and take a picture, and then look at it. It wasn’t blocked enough to make it worth hauling the ladder around the corner. Yay! I still have to do the east side of the house, but that’s easier — pretty much a straight shot, so I just put the ladder up once and then slide it. I’m waiting till afternoon when the sun is on the other side, though. The laundry basket was overflowing today. So I sorted stuff, and filled a basket with biking clothes, along with underwear and socks. And then I dumped it all in the washer, added some detergent, selected cold and regular speed, and went upstairs to watch TV with Robin. Later, I paused the movie we were watching and went down to put stuff in the dryer. I opened the washer to find the hindmost 2 feet of a large black rat snake lying on top of my clothes. I like snakes. Whole ones. Pieces of snakes, in my laundry, kind of gross me out. I went through all my clothes three times. No other pieces, except a green wobbly bit* stuck to the side of the interior of the washer. I’m now running the washer with just water to clean it out and I hope flush out any hidden snake parts.